The Q of an antenna can be a useful statistic in assessing whether it is operating as it should. The Q of half wave dipole antenna system on HF depends to some extent on conductor size, its environment (height, type of ground, nearby structures and vegetation, and feed line / matching loss. Nevertheless, it should usually fall in the range of 10 to 13 for good wire dipoles, and if you measure a half wave dipole antenna system to have Q significantly outside that range, it is probably significantly less efficient than it should be. The Q, centre frequency fc and half power bandwidth BW are related by the expression Q=fc/BW. Measuring half power bandwidth and the centre frequency allows calculation of Q. Half power bandwidth of a matched half wave dipole antenna system is the bandwidth between upper and lower points where VSWR=2.618. See Antennas and Q for a fuller explanation of the theory behind this. This article shows a technique for finding the Q of such a half wave dipole using a common VSWR meter even where it is not perfectly matched to the VSWR meter (ie minimum VSWR is greater than 1.000). The following graph is from a NEC simulation of a half wave dipole for 80m, about 10m above average ground. Above is the VSWR curve, plotted here with an expanded and offset Y axis for reading accuracy later. In this case, the feed point impedance is 83Ω at resonance, but for this type of antenna it could be anywhere from 40 to 90Ω at resonance. I have stated that the half power bandwidth of a matched antenna (meaning minimum VSWR is 1.0) is the VSWR(2.618) bandwidth which in this case could be measured with a VSWR meter or analyser calibrated for 83Ω, but how can we assess the half power bandwidth in this case using a 50Ω VSWR meter or analyser? The little calculator at Calculate Antenna Q from VSWR bandwidth measurement can be of assistance with this type of scenario. By noting the minimum VSWR and carefully measuring the bandwidth at some significantly greater VSWR, half power bandwidth can be calculated. In this case, half power bandwidth is calculated to be 343kHz and Q is 10.5. Above is the VSWR curve for the same system re-plotted using 83Ω as the reference. 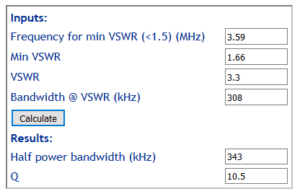 If you carefully measure the bandwidth for VSWR(2.618) you will get very close to 343kHz and again Q around 10.5. If your analyser or associated software can re-interpret the measured R,X values to an arbitrary reference, and you choose that reference for minimum VSWR equal to 1, then finding the VSWR(2.618) bandwidth gives the most accurate result for half power bandwidth and Q. Otherwise, for antennas where where X changes much faster than R with frequency about minimum VSWR, the calculator provides a good approximation for half power bandwidth and Q.